KFC's "We're sorry" print campaign by Mother after its chicken shortage led to it closing several UK outlets has won a gold Cannes Lion in the Print & Publishing category. 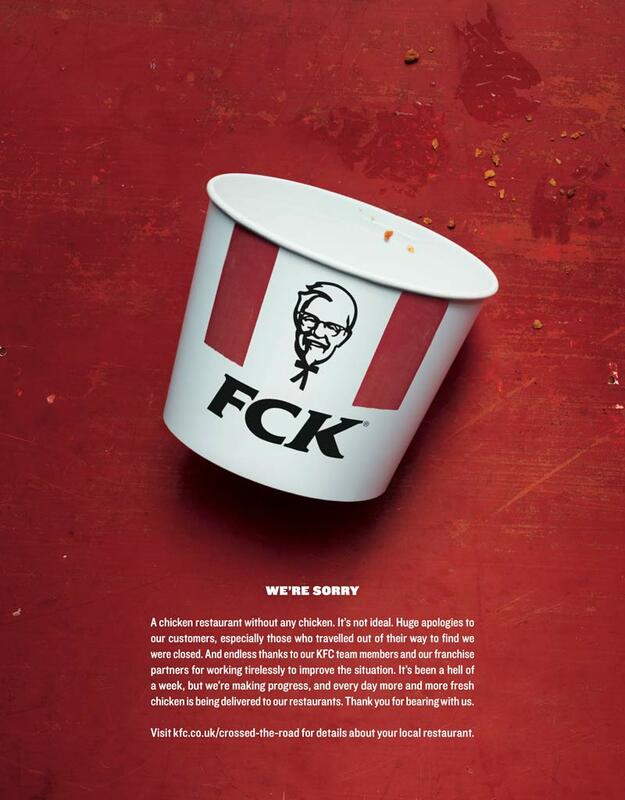 The humourous campaign switched the KFC letters to "FCK" on the front of a fried chicken bucket, with copy below explaining the situation, and pointed consumers to its website to check for status updates. Mother was the only UK agency to be awarded a gong in the category. Brazilian agency Africa took home the Grand Prix for "Tagwords" for Anheuser-Busch InBev’s Budweiser. The work tracked different musicians who had been pictured with a Budweiser over the years, such as Mick Jagger or John Lydon. Last year there were no golds for UK agencies in the Print & Publishing category, and Burger King’s "Flame-grilled since 1954" by David Miami won the Grand Prix.